First off, a very Happy New Year to all my readers. All 17 of you! I hope your holiday season was filled with fun, friends, family and of course…copious amounts of delicious FOOD! The past month was a whirlwind of activity both in and out of the kitchen for me here at Zia’s Kitchen, not just due to special holiday meals, but also because my birthday falls smack in between Thanksgiving and Christmas. It was difficult to get out of the kitchen and to my computer, but I am back now to ring in the New Year and share some of my culinary adventures from the 2013 Holiday Season and my new adventures in 2014. To begin with…….. 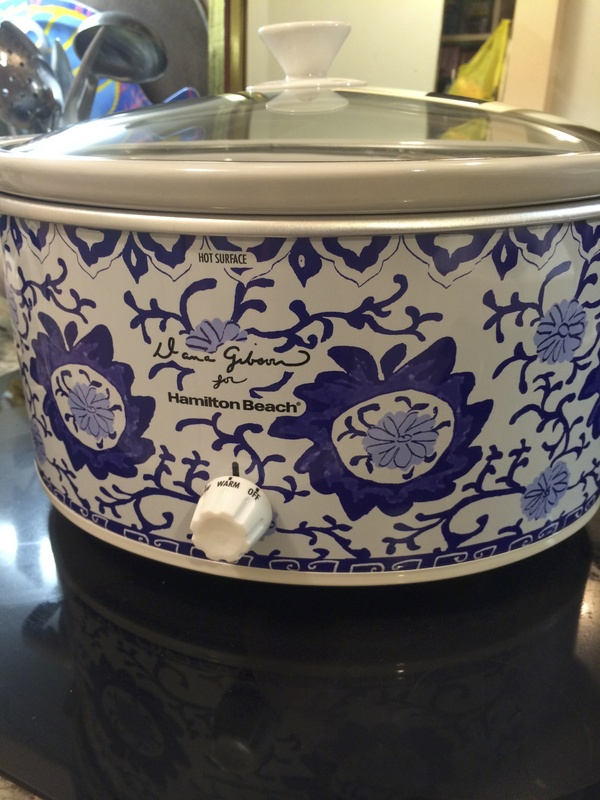 I finally got a slow cooker! I guess all the dropped hints and downright “oh I wish I had a slow cooker” comments did not in fact go unnoticed. Of course the fact that this birthday gift will benefit everyone in the family probably didn’t hurt either! Pretty isn’t it? Mama Sis did a great job. Now I have never cooked with a slow cooker before. Here in Florida the weather rarely gets cold enough to crave stew and soup and all other kinds of warm wintery meals, but I like making them anyway. I started off creating a new Pinterest board dedicated to slow cooker meals and now have 2 of them completed, both were hits and made me excited to try more. I found the basic recipe/gist for both online of course, but tweaked them both in accordance to what I had on hand and my personal taste preferences. First up the Chicken Chili. 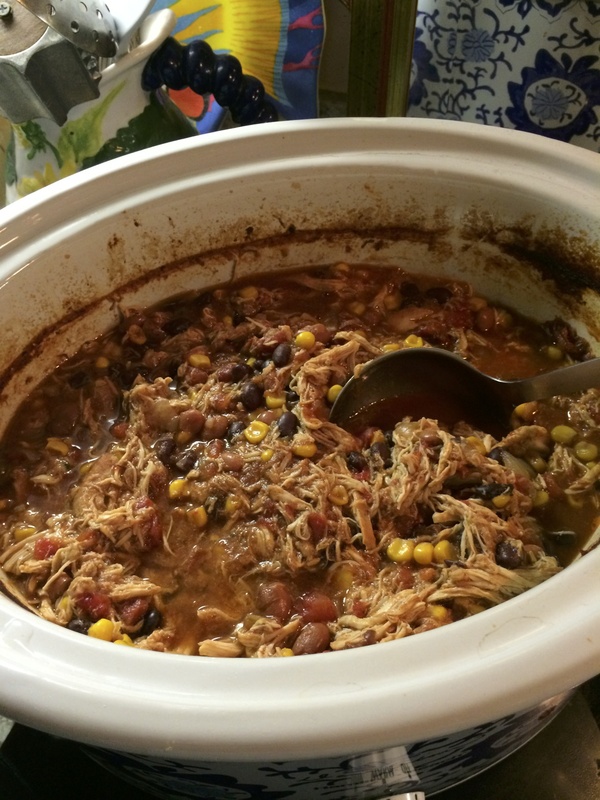 this was my first foray into the Slow Cooker world, and for some reason both Nona and I were craving chili so I looked at what I had on hand, picked up a few other things and set to it. *Note, I have learned best to be prepared in advance so as to get meals like this in the pot in the morning as the tool really lives up to its name and cooks VERY SLOW, so if you need to have dinner on the table for little mouths around 6pm, plan accordingly…as I will in the future. 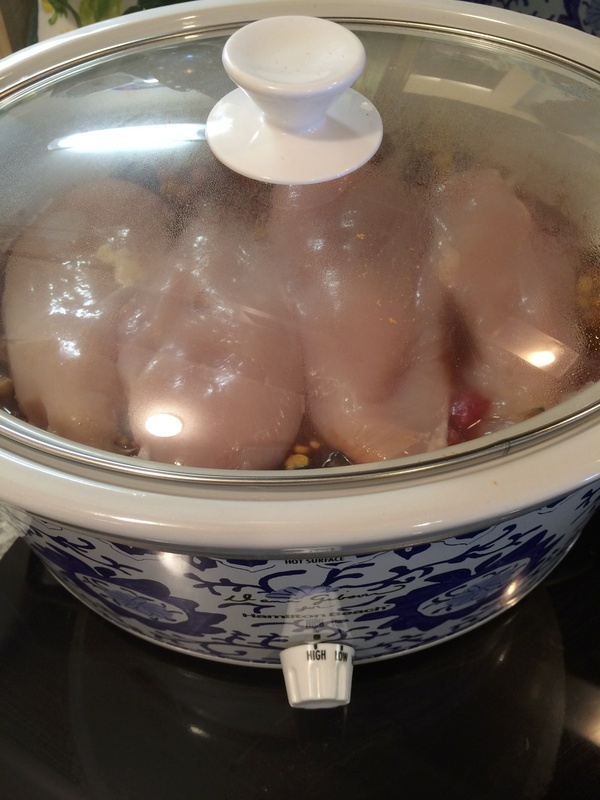 The best part about a slow cooker meal? Very few steps. Basically add all the ingredients (except the chicken) in there, give it a stir, then lay the chicken breasts on top, cover and turn on. I stared this to late in the morning so I cooked it on HIGH for about 5 or 6 hours. I then removed the chicken breasts and shredded them with 2 forks in a dish. The chicken truly falls apart for you beautifully. Then I added it back in and turned the cooker down to low for another hour and ended up with perfect chicken chili! See how easy it shreds? Looks and tastes pretty yummy. As you can see this has quite a few ingredients, many of which we had in the house, which inspired me to make it in the first place. This particular slow cooker recipe has a few more steps then the norm to get it just right, but they are worth it in my opinion. Again no exact measurements, but I think the great thing about these kinds of meals is you can get creative with them. First up I prepared / chopped / minced / diced etc all the ingredients and put into bowls (as you can see obviously). That way once I was done with the Pre-cook element of the dish I could dump it all in and be good to go. Then I took the meat cubes, cut them down to smaller bite sized pieces (little monkeys have smaller mouths). I then patted the pieces dry with paper towels and seasoned them with salt and pepper. Dried meat browns better. Then in my large LeCrueset Pan, I heated a bit of olive oil and browned the meat in small batches over medium high heat, (don’t crowd the meat for better browning) cooking each side for a few moments, until nice and brown on each side, repeating in batches until all the meat was browned. Pat dry and season the meat. Don’t crowd the meat, do it in several batches, it is worth the extra step. It doesn’t need to be fully cooked, it’s better if it isn’t, but browned like this is what you are trying to achieve. When you are done, de-glaze the pan by adding a bit of water or stock and scrape up all the browned bits, turn the heat down to medium and toss in the garlic and chopped onions for a a little sauté. Again don’t over cook, just soften them so only for a few moments. This looks good and ready. Finally add all of the ingredients (EXCEPT THE PEAS! They will turn to mush- add at the end) into the slow cooker, the stock I probably added about 1 cup of each, perhaps a bit more once everything was in there. I mixed it just a little, added the meat on top, put a few bay leaves in and then put some fresh thyme sprigs on top. By the time I was at this point it was already noon, so I set it to high and served it around 6:30pm. (Removing Bay leaves and thyme sprigs of course) It was pretty tasty although it needed a bit more salt. Those potatoes absorb a lot of salt and I tend to under salt things at first. This also freezes beautifully, put in tupperware, wait until cooled, cover and freeze. We just pulled some out of the freezer and ate it yesterday – delicious! 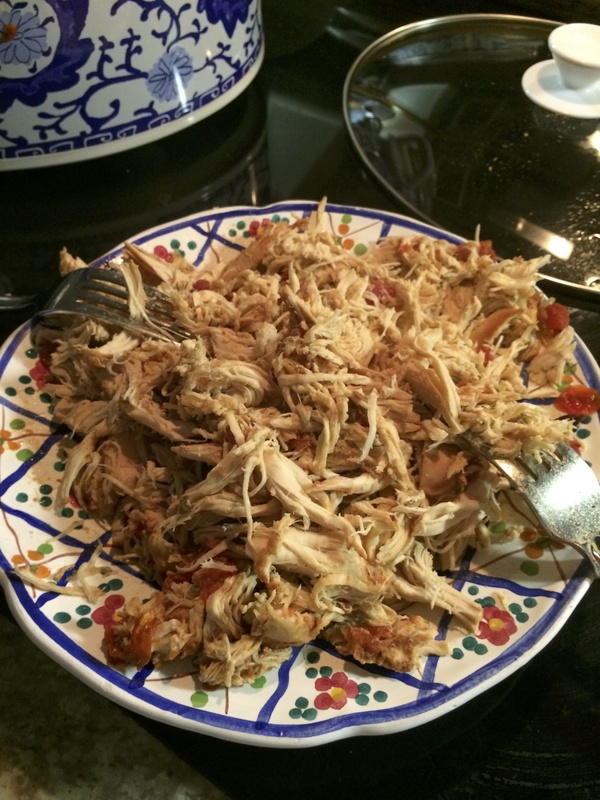 So there you have it, my first meals in my slow cooker. I am currently researching more so I can pre-prepare and freeze the ingredients. We have some big family things in the very near future which will dramatically cut my time in the kitchen for a few weeks, so I must be prepared. I will post on how that all turns out.